Podcast with Diana Rodgers, RD: On this episode of the Sustainable Dish Podcast. I speak with Mike Lorentz from Lorentz Meats in Cannon Falls, Minnesota. Mike and I discuss navigating USDA meat processing regulations, changes in the slaughter landscape, Temple Grandin, and the future of meat processing. 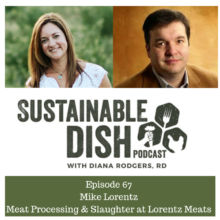 Lorentz Take: Diana and Mike crossed paths at recent back-to-back events, culminating in this conversation about sustainable meat processing.